Our 2 units, available in 500ml and 300ml capacity, provide the ultimate in controlled application of Liquid Nitrogen to the lesion. All products designed and manufactured by Brymill Cryogenic Systems are done so in accordance with appropriate F.D.A. and International Regulatory Requirements, underscoring Brymill’s commitment to supplying safe quality products. 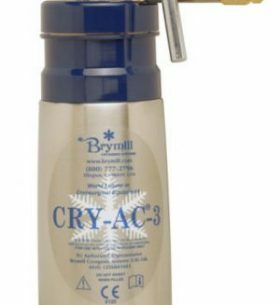 Brymill is the world leading manufacturer of handheld, liquid nitrogen cryosurgery devices used to treat a wide range of common skin lesions. BRY-1000 starter package comes with: CRY-AC3 10oz, Withdrawal Tube, 20/20 Dewar, Cryoplate, 5 spray tips and 1 bent spray aperture.